The ME66/K6 - Super-Cardioid Mic Capsule with K6 Kit from B&H is a popular choice among video, film and ENG / EFP professionals. 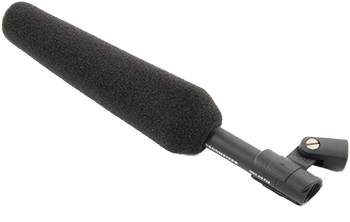 The capsule features a highly directional, cardioid polar pattern yielding great attenuation at the sides of the microphone, maximizing pickup at the front. The result is a focused pickup in highly ambient environments. A wide 40-20,000Hz frequency response provides detailed, accurate signal reproduction. The ME66 capsule takes advantage of the K6 modular power supply. The K6 houses a standard AA alkaline battery and is also capable of accepting phantom power from outside sources. Its compact design allows mounting to video cameras.